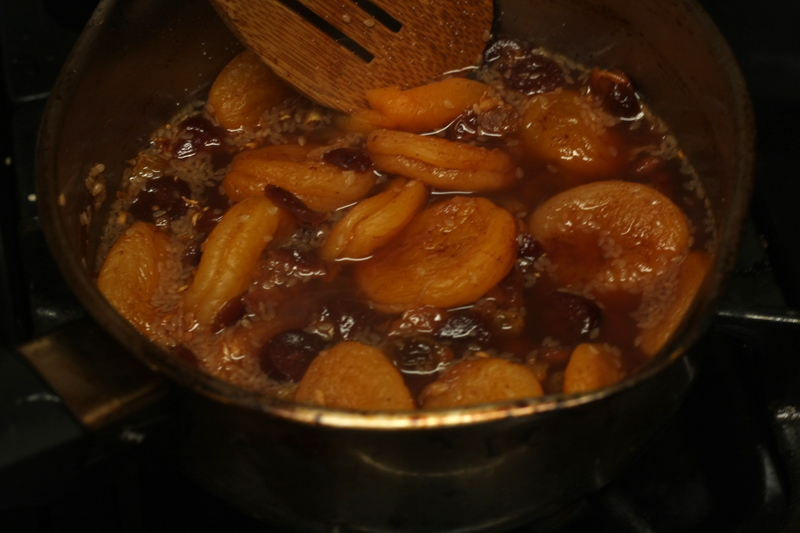 First place all the dried fruit items in a small saucepan; cover with water and simmer on low heat till it reduces into a syrupy coated mixture of deliciousness. Set aside. In the meantime, throw all the chicken items except for the lemon juice into a larger pot, cover with water (and/or chicken broth, if you’ve got some on hand), and bring to a boil, and cook, covered, on medium low heat for about an hour (maybe a little more), flipping over the chicken after 30 minutes. After an hour, remove the lid and cook on high till most of the liquid has boiled off. Serve the chicken on a large platter and top with the dried fruit mixture. Splash just a bit of lemon juice all over the dish – this helps cut through the richness and sweetness of the fruit just a bit.